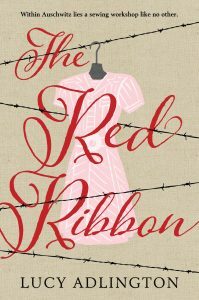 This novel explores a little-known unit of the terrible camp in the context of a heartfelt coming-of-age story. Ella is an appealing heroine; readers are drawn along through the narrative by her growth, change, and experiences with sacrifice, love, and the nature of true friendship. A great accompaniment to any World War II programs or showings of movies like Schindler’s List along with other recent Holocaust-themed titles like What the Night Sings by Vesper Stamper and The Librarian of Auschwitz by Antonio Iturbe. 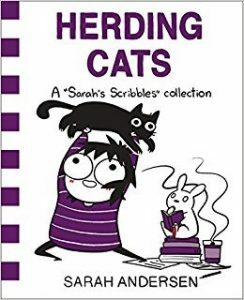 Popular web cartoonist Sarah Andersen’s instantly memeable work is collected in this slim volume of quirky black-and-white comics. Andersen covers a variety of topics from existential angst, cats, caffeine dependence, PMS, cats, and depression. Herding Cats is especially poignant and on-point when dealing with mental illness. Many panels address anxiety and depression with candor, and teens who have those conditions or know someone who does will definitely be able to relate. This volume also contains an essay from the author to other young artists who may not be published and who may be feeling discouraged. 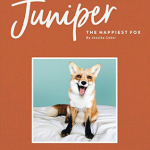 She gives many practical tips, but also addresses the realities of being Internet famous. Teens who are avid Tumblr readers will probably recognize Andersen’s work. Allie Brosh’s Hyperbole and a Half is another illustrated exploration of anxiety, while fans of Jomny Sun’s everyone’s a aliebn when ur a aliebn too will gobble up Herding Cats. 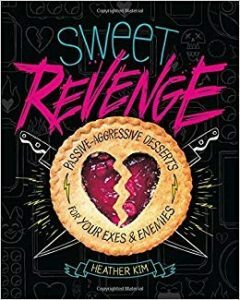 A snarky, angsty cookbook that contains a surprisingly vast array of baking knowledge, recipes, and descriptions, Sweet Revenge is sure to satisfy even the sweetest of teeth and the angriest of jilted lovers. Kill your enemies with kindness by baking them treats with names like Not My Cup of Tea (black tea shortcake), World’s Biggest Flake (Butterfinger® flake bars), and What a Piece of Sheet Cake (cinco leches cake with malted milk whipped cream and dulce de leche drizzle… yum). The creative graphic design and close-up photographs mixed with hilarious anecdotes and an informal, conversational tone make this cookbook much more than just a collection of recipes. There are descriptions of different types of ingredients (who knew there were so many kinds of sugar? ), explanations of which tool is right for which job, and a detailed index for easy location of specific recipes. Other oddball cookbooks that pair well with Sweet Desserts include Sandwiches: More Than You’ve Ever Wanted to Know About Making and Eating America’s Favorite Food by Alison Deering and Bob Lentz as well as The Wizard’s Cookbook: Magical Recipes Inspired by Harry Potter, Merlin, The Wizard of Oz, and More by Aurelia Beaupommier. “Lightning” Lu is heading into the track championships as co-captain of his team. When unexpected hurdles come up, he wonders if lightning can really strike twice. Lu’s delightful cover brings together teammates Ghost, Patina, and Sunny upon an attractive shade of blue. This complements the three previous books, each entitled with the characters listed above. Although those who have been following the Track series will appreciate references from past books, Lu can also stand alone for those new to the series. The windows and mirrors (Dr. Rudine Sims Bishop, 1990) provided make the diverse characters relatable and authentic to readers. Lu takes off with a quick hook and short chapters to entice reluctant readers, clocking in at a very accessible 224 pages. Of special note in this volume is Lu’s relationship with both his father and his coach, who have some history together that will come as a surprise to readers. As a result, Lu finds new ways to identify with his father and digs deep when learning about integrity. 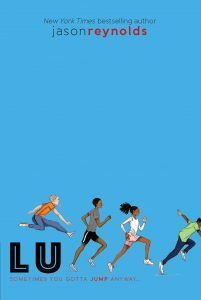 Themes of track sports and bullying will resonate with all genders and reach a broad spectrum of readers. 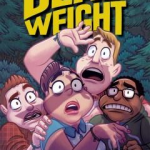 In typical Reynolds style, the banter amongst the characters is hilarious, witty, and engaging. 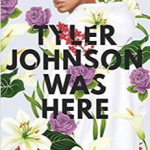 Those who are sorry to see this series come to an end may find common ground in middle grade selections such as Harbor Me by Jacqueline Woodson, The Stars Beneath Our Feet by David Barclay Moore, and The Crossover and Booked by Kwame Alexander. Cass can talk to ghosts. Years ago, a freak accident caused a near-death experience for 12-year-old Cass. Ever since then, she has been able to speak to ghosts and enter beyond “the veil” to discover what happened to these people as they died. When Cass’s parents get an opportunity to create their own paranormal TV show, the group heads to one of the most haunted cities in the world- Edinburgh, Scotland. Here, Cass comes face-to-face with the truth behind her gift and a powerful spirit who will do whatever it takes to take it away from her. 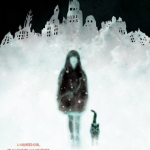 Victoria Schwab is back at writing middle grade fiction and has done so with a light, creepy, and often humorous story with City of Ghosts. 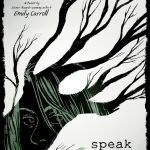 While older teens may be drawn to the eerie cover, this book is intended for a younger teen audience who want a hint of ghost story and less pure horror. 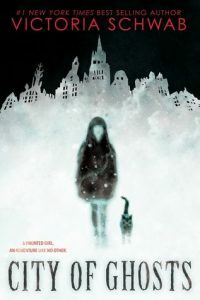 City of Ghosts is a perfect middle grade book for readers who want the fast-paced plot line of Doll Bones by Holly Black, or the horror element of Took by Mary Downing Hahn. Plus, Cass’s story is the start of a new series, so readers can anticipate more haunted stories to come.